More than 30 properties to choose from. This is the long list of bungalows for sale in Torrevieja that our real estate agency has prepared for all those customers who want to buy a property for resale or new construction on the Costa Blanca South. Our bungalows are composed of different qualities so that all those interested, regardless of their tastes or priorities, can find the home of their dreams. Many of our bungalows in Torrevieja offer an incredible pool. A prominent area of the property, which many customers consider of vital importance to bet on said housing. With a property with a pool, your family and you, you can refresh and have fun for hours. Thanks to the spectacular weather enjoyed by Torrevieja, you can enjoy the pool practically all year round. Another one of the many highlighted areas of our bungalows for sale are their prepared areas to enjoy the tranquility and good weather. In many of our bungalows you can sunbathe in places designed for it. Enjoying peace, can also be considered part of the entertainment of a home. What does Torrevieja offer to bet on our bungalows for sale? If you want to buy a property in a place where you can enjoy several leisure areas, that home could be one of our bungalows for sale in Torrevieja. The city is composed of different leisure areas for any person and age. The little ones can enjoy water parks, shopping centers, karts ... For adults there are also places where you can find entertainment: nightclubs, chill - outs, restaurants, casinos, golf courses, etc. But if there are any of the most tourist areas of the city, that's the beaches of Torrevieja. The city has a coast, divided into several beaches, so you can discover all its qualities. Its waters are transparent and its sand is very comfortable. An ideal place to enjoy whole days with the family. 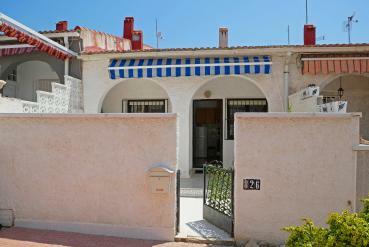 Would you like to buy one of our bungalows for sale in Torrevieja? If you are predisposed to buy one of our amazing bungalows for sale in Torrevieja, you can come to start your new life at Calle Bizet Shopping Center - Local 6 La Siesta - 03184 Torrevieja (Alicante - Spain). If you want to call our office, you can do so by dialing 0034 966 785 202 or 0034 669 366 996. Finally, you can contact our real estate by email. Send us your mail to info@casasespania.com.